Pete's mother won't let him keep Mishmash, an extraordinary dog who likes to sleep on beds and sit at the table for meals, so Pete gives him to Miss Patch, his favorite teacher. About Molly Cone (Author) : Molly Cone is a published author of children's books. 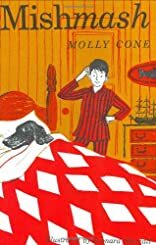 Some of the published credits of Molly Cone include Mishmash and the Big Fat Problem, Mishmash and the Substitute Teacher.